"We are not in the market"
"We have company X, Y and Z that offers us the same opportunity"
Looks like prospects have a way of bailing out and you have exhausted every closing strategy on the planet earth. That is a sign that you need appointment setting services. Sales, looks like a job that you didn't sign up. Now you're worried what might happen if the situation continues like this for the next two months, your job is on the line. But, there is a good news for you. Imagine if you could get inside your customer's mind and press the buy buttons. Imagine if you could figure the right words, choices of phrases to use so that you can close the deal. Imagine if the same customer, told you, I am in, where is the contract, I want to sign. Do you know the number one reason why business fails? According to entrepreneur magazine, 8 out of 10 businesses fail within 18 months. Why? Such failure you may ask. It is because of lack of capital. In other words, the business run of out cash. The next question is, why did the business run of out cash? The number one reason is that they didn't sell more of their product and services to customers. That's why they had negative cash flow that was inadequate to meet their expenses. From that example, it comes back to sales. If you're qualifying customers, you’ll sell less of your product or sell only to those interested. When you're in business, you have to cater for three types of client in your market. You product price must accommodate the low-end customer, the mid-range customer and the high-end customer. You need to understand all the pain point for these three types of client. That said, you need to treat every call like your life depends on it. You need to show care for the interest of the person calling. Business is not like school, where the most qualified gets ahead. Even if you sold your product to a high-end client or low end client, as long as the client justified the purchase. They will buy it, whether cheap or expensive. It's not a new thing finding, families spending $10,000 per year, just to take a trip to Disneyland. Imagine this are poor families with little saving to empty bank accounts. Imagine you're selling sales training program. There is no need to qualify a client if you are selling such a service. Every company knows whether big or small that they need sales to expand and grow. And if you don't get them excited about what you are selling, you lose them. Takeaway: Instead of qualifying and screening client, find out what they need. Or the reasons that will make them buy the products. (More on this later). Objections may be a sign that your prospect is interested in your product or services. Hey, what if it is not. What if, it is a way of a customer getting rid of you. And the more you fight with rebuttals, the more they find ways to bail out. Sometimes I find rebuttals to be pushy. Although sometimes you need to be pushy, no offense there. I do it. Rebuttals happen for a reason. Objections happen because the customer doesn't understand your products or service. Or they can't justify the purchase. If the customer is going to spend $5000 per year on your accounting software, they need to justify that the software is worth more that what they paid off. Until they see that, they will give you every objection on the planet just to send you back. You have to show them their return of investment or how the product will save them time or increase revenue. Instead of saying saving time, you need to show them what numbers, how much time are they going to save every month or year. And you have to justify that your product is better than what they are currently using. If you want to get rid of objections out of the way. Make sure that the customer understand your product details. I don't mean a presentation. I mean how it can solve his problem, saves his time or money. How To Close A Sale To Clients Already Sold To The Competition. The tips below can apply to all clients. When you are making a phone call, you need to address certain issues and concerns that clients have. This section will help you tailor your phone call or even presentation for the appointment. Of course, the best ways is not asking them what their goals are. Your job is to uncover them. You know the goals they have by figuring out the results they want. How can you know the results that they want. Simple, think like a client. Here is how to do it. Imagine you are a CEO of a company and you're meeting face to face with a friend. How would you describe to them if you had a good day at the company. Or if something good happened at the company and you are responsible for it. Ask yourself, why a client would want your accounting software? I will do bookkeeping much faster because their software sync everything. That means, I can get financial data from PayPal, Webpay, Payoneer without having to log physically to download the report. In this case the accounting softwares save time for your organization. Never start a phone call with a pitch, or present your product without knowing your customer's business. Questions are the vehicle to uncover problems that they have. When you know their problems, it become easier for you to sell them. It becomes easier for you to solve any objections they may have. Questions are a sign that you are interested in their business goals and objectives. If you pitch your product first, you come off looking after your own interest. Making inquiries will help you know the hot buttons that you'll press when you make a presentation or close a customer. It will also help you, tailor-made your product or service to suit that specific customer. The number one reason why people buy products is to solve a problem. Your job is to figure out what those problems are. If people buy things to solve a problem and questions are your vehicle to reveal the problem. Understand that most people are reluctant to reveal their problem because it is the key to closing a deal with them. The more savvy of a person you are dealing with, the more intelligent, somebody is, the closer they are to hold on those problems. The last thing that people want is to volunteer a problem that they are having. Questions that you need to ask? Always focus on previous experiences. Have you used a third party trainer in the past? Yes. Okay, tell me more about it. What are you currently using for training? How has that worked for you? What do you love about the training? Were you satisfied with their services? No. Why? What problem are you having with your salespeople that if I can solve for you, you would sign up for a product today. When was the last time you spend $XXXX this much on a product? Did you get any results as a result of spending that much? The key here is to write everything down that you'll use in your presentation or closing. If they are happy to proceed to a presentation, they you can tailor your presentation address the problems that they are having. When presenting the product, make a big claim, that when they don't see the results, you'll pay them $1000 back or even refund them. You need to stand behind your product to close. Takeaway: Questions are keys to uncover client’s past experiences and problems. When you know the client’s problems, you can tailor your presentation and use the right close. If you've asked the right questions on the phone or in-person. Chances are the client is already sold on your services or product. Or they want at least to hear your presentation, to find out what your products can do. Even the best sales presentation on the planet won't close the sale. Once you have gathered every bit of information about their problem or goals. You need to still fact find before the presentation. You just want to make sure that you and the client have the same expectation about the meeting you want to have. Most clients, before they move into the presentation will know what they want already. Others will need to listen to you out of curiosity to find out what you are saying. Fact finding is a cure to all sales illness, because if you figure out what they want, you will come up with a tailor made solution to cater their needs. Hey Steve, thank you for giving me time today. I want to know what you hope to gain or achieve just so I make sure we use the best usage of your time. What do you want to get from today's meeting? You ask the question to get an idea of what is going on his mind. It's extremely important to know his expectation and goals. This question can also tell you about the things that you need to focus on your presentation. I know your wife is going to be an extremely important person in this decision making process, what do you think is going to be the most important for her? What do you think should I cover that your wife will want to know before you make a decision? After those two questions, you can go straight to the presentation of your products or services. Your presentation should touch the pain points, problems and goals that your clients hope to achieve. If you have read the earlier section, by now you could have discovered lots of great questions and uncovered problems that your clients is experiencing. Yes, it's true that you can be a great at making phone calls, prospecting, getting appointment, presenting the products but fail to close a client. It happens. You see great sales presenters, but fail when it comes to asking for the sale. A professional closer doesn't wait until the end of the presentation to close the customer. You need to ask the sale every time. What do you like best about what I have just told you so far? You ask that question to know the features that they like about your product. You can tell them lots of features, but the customer will love maybe three or 6 features of the products. And those can be the only thing that you need to close the sale. You can use those features to close the sale. What about if the customer doesn't say anything or negative? It will depend on the response. If there is no positive feedback. It means two things: either the customer doesn't understand what you have just said. Probably, their mind might be somewhere or you need to explain more about your product or services further..
How much of what I have just said do you believe? In other words, what percentage of what I have just said do you believe? Here you are looking for the clues that matters to him. You want to find out what part of your presentation they believe. Are they confident that your product or services can help them solve the problems that they have. After listening to their feelings and opinions on the subject. You can ask them: If only I can help you achieve a tiny fraction of what I have just said, would you sign up for our program. The last time you did something about Social media, what what the one factor that had the biggest effect on you making the decision? The last time someone sold you a car, what was the one factor that made the difference you saying yes versus saying no? Selling is creating a process. You only get results if you are creative enough to close the customer. Customers are savvy people, they have a high resistance temperature. They're willing to attack you with every objection. If you uncover the client's problems, sprinkle the trial closes in your presentation. The chances of closing the sale are high. In fact, you'll close 80% of the time, whether you have a savvy client or novice one. Takeaway: In other words, a trial close tells you when to move to the next level, which is to close the sale or, how much your client understands your product. The sales process is the most hated activities in any organization, especially if you're dealing with B2B companies. If the above process sounds train wreck for you, you can outsource appointment setting services. The question now is, when do you outsource a B2B appointment setting service? Selling is an art and you will need to have a person that knows how to handle the process from prospecting to closing the sale. Unfortunately, not everybody will master everything along the way. It takes time to master all the seven processes of selling. For that reason, unless you're confident to manage and control the entire process. It is better to save time and look for a lead generation appointment setting company. They are trained and smart enough to follow the above process careful. This can save you enough amount of time and speed up the sales cycle. Most importantly, once you hire the right company, you'll be left with the task of meeting and closing the deal. If you can master the art of closing the deal and the rest you leave it up to the B2B appointment company, rest assured that you'll get results. Takeaway: In other words, engaging with a company that specialize in the B2B appointment setting will free up you up, for optimized performance in the sales process. There is no doubt that if you work with consultant that understand their field, you get results. That comes when you are analyzing your conversion rates at the end of every month. Top lead generation appointment setting company, knows how to handle clients and when to press the hot buttons. That means that chances for landing a high-end clients are high, which means better conversion and higher earning. In addition to better conversion, you should experience short sales cycle with well-qualified leads. There are months in sales when the pipeline is dry like the Sahara desert. This is the most stressful moment, because it means people now have to work overtime and their reading desperation on their face. It is when your best assets in the company who would rather focus on something else are spending time pounding the phone. Then comes the days when your sales pipeline is bursting with opportunities. This is the most tragic time, because your team will spend their time in strategic meeting, presentation, closing deals. Their time will be spent focused on the number of inquiries that they are getting and they will forget the next month when the sales pipeline is likely to be dry again. The truth is no such thing is a regular basis. You need to have leads, inquiries coming every moment because your business depends on it. And if you lag away for one minute, you're likely to have a dry month. It can be very difficult, sometimes tempting to think that you'll always have your pipeline bursting with opportunities every month. To avoid dry situations like this, you'll need to outsource appointment setting services to keep your pipeline full and always bursting with opportunities. The fact that your sales team managed to close a million dollar client this month, doesn't mean that next month they will close another million dollar client. Make sure that you have a dedicated team that is always on the hunt to keep your pipeline full. Ready To Go Inside The Client's Mind To Close A Sale? That is called success. Yes, you can manage the sales process. However, you need to be a master of all the 7 stages of selling. Selling is an art. You can’t possess all the skills unless you have been in the sales profession for a decade. However, if you outsourced appointment setting services to a reputable company. You have only two jobs to do: walk the client through the presentation and close the deal, period. Your time as a business owner is important. In fact, your time is better spent with qualified leads and closing deals rather than setting an appointment. If you follow the above tips correctly, months from now your business will be generating more revenue every single month, because you have a dedicated team that are doing all they could to support the mission you have, and fulfill the promise you’ve made to client. Rest assured with the above tips you can kiss goodbye to dry months. 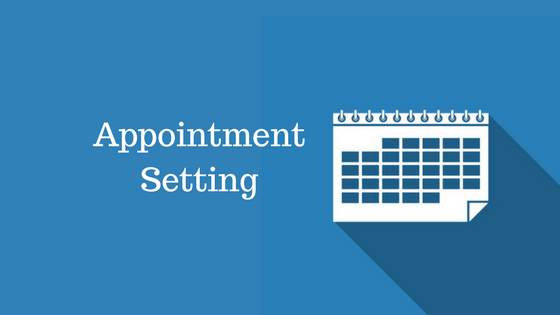 Appointment setting services work.